After I walked out the film, because I read some early reviews, I thought to myself "Wow, early o have benefits" because while there were areas where I wasn't disappointed in terms of expectations, it was disappointing in unexpected, greater areas. Crimson Peak follows the story of a writer named Edith (Mia Wasikowska) who is swept off her feet by the mysterious Thomas Sharpe (Tom Hiddleston) whom she marries and lives with both him and his sister Lucille (Jessica Chastain) at their mansion called Crimson Peak. But as she stays with them both, she becomes haunted by the literal ghosts of her pasts and uncovers hidden mysteries within the walls of Crimson Peak. First off, the film looks gorgeous! Director Guillermo Del Toro has a very keen visual eye and even when his films are so-so, they all look amazing. I thought the costumes were very ravishing and the production design looked absolutely beautiful. I especially liked the red dirt road leading into Crimson Peak. While the actors do a fine job, the standout, in my opinion, is Tom Hiddleston as Thomas. I thought he captured Thomas' sly charm, as well as his elusive nature, perfectly. I also thought Jessica Chastain was really good as Lucille. Even if I thought she was "scene-chewy" at times, I still got a kick out of watching her villainous performance. Also, on a side note, do not go into this expecting a ghost story. As even Del Toro himself has stated, this is a Gothic romance. I would slightly agree with him on that note and say it is also a mystery. I would say that the weakest element is the script. One thing that didn't feel right is the inclusion of the ghosts. Even if you were to take them out, you would still have the same movie because there are scenes of Mia Wasikowska wandering the halls of Crimson Peak, searching for ghosts and they just go nowhere. While Guillermo Del Toro has incorporated ghosts and creatures into films like The Devil's Backbone and Pan's Labyrinth, those were used as metaphors for their respective stories that were incorporated. Like how The Pale Man in Pan's Labyrinth that has the big dinner table is a symbol for the top of the heirarchal class system. So the monsters in Del Toro's films usually work as symbols of something yet I had trouble figuring out what the ghosts in this meant. Also, while Mia Wasikowska does a fine job with what she is given, she isn't given anything to do other than act scared and wander and investigate the mystery. Charlie Hunnam from Sons of Anarchy has a small role as a doctor infatuated with Wasikowska's character and he was not only underused, but his friendzoned character was cliched. A lot of plot points were pretty cliched. There is even a big reveal that I even sensed as the film progressed and won't reveal. 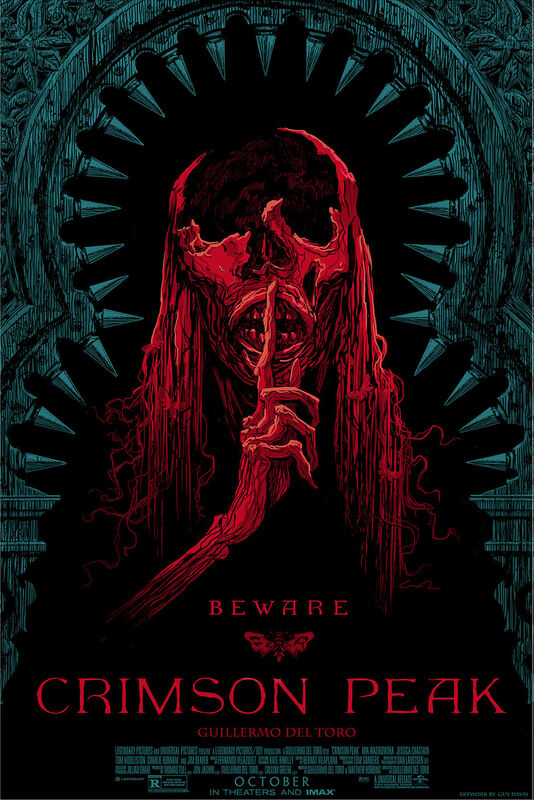 Overall, Crimson Peak is incredibly stylish yet is shrouded in mystery and scares that we can already figure out. The film has some standout performances and beautiful production design, but it is nowhere near Guillermo Del Toro's best work.